On the evening of Friday 29th July 2011 a fire started right in the middle of Slovo Squatter Camp in Coronationville, Johannesburg, on the edge of Crosby. The fire brigade was called but residents complained that the response was terribly slow and that there was not enough water. Rumours of three children and a grandmother dying proved unfounded but at least two children were taken to hospital with inhalation injuries and at least one man broke his wrist in the confusion. All the people grabbed what possessions they could and fled for their lives. Many had burns and breathing problems as mattress after mattress melted away in the inferno, releasing cyanide into the air. The hall of Coronation Secondary School was taken over by a "task team", but people were impatient as the politicians sat and talked. They said: "We cannot leave our shacks or we will have no land upon which to rebuild." And those who had salvaged possessions said: "We cannot leave even this small pile of things or they will be gone in an instant." Many gathered outside the school and temporary shelter was offered to newly-homeless residents in another school building a short walk away. But as the sun set the men were still hammering metal, beating crumpled corrugated iron back into a shape to give them some shelter for the bitterly cold and windy night that lay ahead. They even took the coiled spring skeletons of former mattresses, wrapping them in plastic bags to try to make a semi-rigid wall. And women mixed sand and cement with bare hands, to try to fix their corner poles into something concrete. 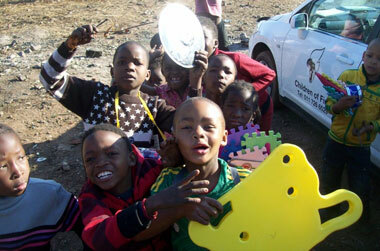 Children of Fire's UMashesha volunteers went to the scene early in the morning, with scarlet-red disaster recovery bags containing saucepans, tinned food, clothes-washing-powder, soap, toothbrushes and toothpaste, tin openers, Vaseline, plasters, facecloths and other practical items. They took eight packed-full car loads of clothes, shoes, blankets, toys and it was simply not enough. The Spar gave a little bread and other shops and kind members of the public brought fruit and sandwiches to the secondary school. Some people from the brick-built formal housing arrived with white-bread polony sandwiches for the people trying to rebuild. The most dire shortage was of building materials. People needed "zincs" as they call the corrugated iron sheeting; they need wooden poles to mark the corners of their new homes and they need wood upon which to try to fix new ceilings. There was no visible delivery of building materials from government until two days after the fire they got one zinc sheet per family (as did some families whose homes were still intact). Friends or employers of residents brought them some money or a few pieces of wood or a few sheets of metal. But it was not enough. Men walked several kilometres in pairs, in search of just four pieces of wood with which to start making a home again, carrying the long timber poles over their shoulders. Women and even children tried to carry zinc wall-and-roof sheets on their heads, or pieces of sponge salvaged from the recycling dump, that they hoped to sleep on. Our team of volunteers: Abegail Ximba, Amanda Simanga, Londeka Ngidi, Bart Smit, Bronwen Jones and Brian Comrie went to the camp again and again and again. Mortain Dube looked after the Children of Fire children so that we could devote our energy to helping the hundreds of people in need. On subsequent days Louis Rutstein, Rosie Chirongoma, Mitta Lebaka, Tristan Jones, Mpho Makhubela all pitched in to help as well. We helped from July into August, on the Saturday, Sunday, Monday, Tuesday, Wednesday, Thursday and still the need was not met. We used all our resources; our own children handed on their clothes, their blankets, their mielie meal and their storage containers. Thanks especially to Sandton Rotary who had previously helped us with getting disaster recovery bags sewn and some of the vital components. The simplest things make life worth living - the chance to wash one's face, to wash one's clothes, to put a plaster on a small injury, or to cook a meal for one's own family. Disaster relief is not a core function of Children of Fire. Our main task is to try to repair badly burned children, body and mind. But within the communities that we know and where it is geographically feasible, we try to help and we will continue to help. The Disaster Recovery Bags are a visual aid to government; a hint of humanity in troubled times. Below the account of two international volunteers and one local (ECape) volunteer, who gave invaluable help. Bart Smit: Dutch UMashesha volunteer. When I heard there had been a big squatter camp fire in Slovo last night, and that we would go there to provide them with supplies, I was nervous. I had been in Slovo two times before. During my first visit, I had imagined what would happen if a fire started there. The houses are close together, the streets are too narrow for fire trucks to pass. The materials of the shacks are very flammable. This time I didn't have to imagine it, I would see it. So I prepared myself for the worst. Being at the place, I felt really sad, because I saw how many families were affected by this fire. Seeing the disaster place is very different to just hearing that there are 220 families affected. It was all very unreal to me, and I will never be able to describe how I felt when I saw that place. It looked like the pictures and videos of disaster places that you can find on the Internet or can see on TV, but it's different. Standing in the middle of it is just unreal. Everything was burned down to the ground; 800 or more people lost everything they had. And they already had little. Burned wood, ash and coal everywhere, the smell of the fire was still there. Everywhere, people were breaking down their burned shacks, so that they could try to rebuild. 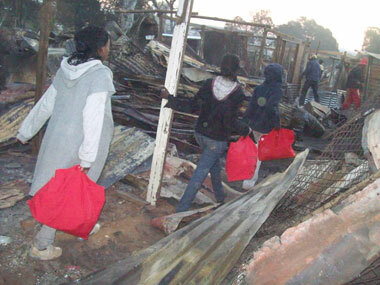 We carried Children of Fire's disaster recovery bags into the disaster area, and handed them out to people. Handing out resources in a squatter camp after devastation is a real challenge, because people will come and just start taking as much as they can grab. It is challenging to control the people or to form a queue. Many people seemed unthankful for the things that were given to them, but they complained if they did not get what they wanted. After the second round of handing out resources (the girls had started several hours before me) everybody left Slovo to get new supplies, and I stayed there alone to take down notes. I asked people what their shack number was, what their names are, how many children they have, how old the children are and if there were any special needs (e.g. a disease, disability etc.). Most of them simply said: "I need just anything, because I lost everything". They had nothing left. No food, no blankets, no clothes, nothing. And there were not just a few people telling me that they lost everything, there were dozens. And they were just a few of the people out of all the people that were affected by the fire. For me, a person lucky enough to live in a house with basically everything I need, it's just impossible to imagine what it would be like. These people had no house that night, because the fire started at around 8pm. And that day it was cold. Really cold. And it was very windy. Those circumstances and the extent of those circumstances (at least 800 people), I cannot comprehend. People showed me videos on their cell phones of the fire. The fire is so big that it is impossible for me to absorb. I was really surprised by how fast the people were able to rebuild their shacks. I arrived there at around 12.30 and the third load of Children of Fire donations arrived at around 3pm and you could not see the full extent of the fire anymore because new shacks started to arise. People were building everywhere; you could hear the noise of all the hammers; clack, clack, clack. A walk into the disaster place, in the middle of where all the people were rebuilding their shacks, was another shock for me, because I could see again how many houses burned down. It's hard to make sure that resources go to the right recipients. There are a lot of desperate people who take too many things, and leave others with nothing. 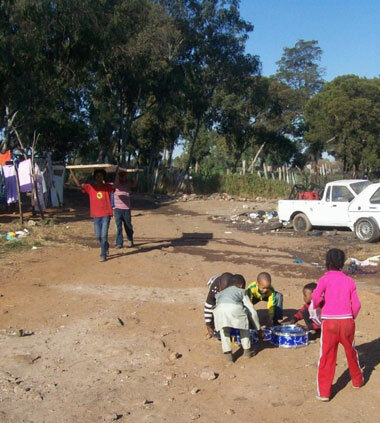 Even people from outside Slovo seemed to profit from the food supplies brought into the squatter camp. Brian Comrie, American UMashesha volunteer. A fire struck the Slovo squatter camp last night around 8pm. It burned hundreds of shanties down to the ground; more than 220 families lost their home last night, they lost it all. When I walked into the office today I heard the news, Bronwen handed me a list of handwritten names, hundreds and hundreds. I typed names onto a computer for more than an hour. They went back to the camp and brought two cars full of supplies as I typed. When they came back it was my turn. We loaded the cars to the brim and we took off. I stayed the rest of the day as the girls went back to bring more supplies. Bronwen was once defamed for supposedly keeping too many donations in her home. I wish the reporter was there today. Because there are no more donations of anything left. Storing for a rainy day and now it had "rained". We pulled right into the camp, deeper and deeper we drove, until we came to the site. We unloaded the supplies on the exact same spot the fire started. It was so surreal. About 1000 people were left with nothing. I heard that the politicians were there, I didn't see them. I tried my best to form a queue for the people so that everyone could get something. It was hopeless. They rushed as soon as I turned my back to hand supplies out. Bronwen and the girls left Bart and I there to stroll around the wreckage and gain an understanding of the scene. Men were building shanties up again. Children cried. Children played. I tried to write more names down but the people disliked this as they thought I was just another politician coming to try and ring votes in. A man showed me pictures of the flames. He said it took hours for the fire brigade to arrive. When they finally arrived one of the trucks did nothing, nothing. They sat in the truck as one of the trucks sprayed the site of where the flames initially took off from. They did nothing to stop the flames from spreading, nothing. The people still believe in themselves. They believe in their capabilities. They believe that if they were given a chance they would surprise everyone. I believe them. But I cannot believe what I saw today. By the time I left about a hundred shanties had already been partly-rebuilt. That means that more than one hundred families will be sleeping the dirt and ash tonight. They won't sleep. They will be too sad to sleep. I stayed at the camp until the sun went down. I stayed as they brought more and more supplies from Children of Fire. We tried our best to make a dent in what was taken from them by the flames the night before. All of the people slept in the dirt last night, but they told me they just laid, they didn't sleep. They couldn't sleep. I couldn't blame them. I thank God the fire happened before it got too late, because then there would have been a lot of death. I guess it's give and take though because last night it was extremely cold. They had no blankets. Some had no shoes. One man told me that he lost R6000 that he saved and kept hidden in his shanty for his family. Now it's gone, now he must start again from scratch tomorrow morning. A drunk man tried his best to attack me, I just shoved him down and continued handing out supplies to the women and children. Some people tried to come into Slovo from out of the camp in order to grab supplies we were handing out, in order to sell them back later. Can you believe that? People had lost it all, and they were still trying to steal from them. I could not believe my ears when a man told me that everything was okay. It was just 'stuff' he said.. No lives were lost he said, we still have our lives he said. Tomorrow is a new day, we will move forward. We will rebuild what was lost and re-gather what was taken by the flames. Unfortunately, later in the day a woman told me that an old lady lost her life last night in the flames. And again, I heard of how the politicians were walking around (not near the disaster site) but up at the top of the camp. 8000 people call the camp home so they thought this was a great opportunity to promise the people more empty promises. Elections are just right around the corner, it'd be a good place to start I guess, if your job was to scratch around for votes. One older man told me of how the politicians have been coming to the camp to tell them if they were elected, homes would be built. And they wouldn't have to live in shanties any more. The old man told me the politicians have been doing that for 40 years now. They continue to live in shacks. The city did nothing for those people today. Children of Fire was the only organisation there right among the people, that seemed to give a damn. I tried my very best to build a wall up around my emotions. That was pointless. People in the western world, and people coming from the western world, including myself, complain about every little thing. I walked further and further into the rubble of wood and zinc, which is used for walls and roofs. Ash covered my shoes, and I thought man! my shoes are dirty now. I still couldn't let go. Again, as I walked deeper and deeper into the camp I saw happy faces. Children weren't crying. They were helping each other. I helped people carry supplies to their new 'homes' to be built among the ashes of what was left behind. What I saw today cannot be communicated. What I saw today can only be felt with the heart. I will never forget it. I kind of felt a bit like Santa Claus walking in and handing out babies booties to mothers, and to mothers-to-be just months away from the birth of their child. I am glad those children didn't have to see what their parents had to go through today. All they want is a job. There are no jobs. A couple of times I was shoved to the ground because people would rush me, I had their future in my hands. Shirts, clothes and canned beans. I just picked myself back up. Amanda Simanga, Eastern Cape UMashesha volunteer and Arson survivor. My day with the Slovo people has really touched me, showed me that I have a better life than some people have. I just couldn't bear the thought of all those families going to bed hungry and other people will be sleeping outside tonight and still there are people who just take advantage of the matter, they take items that don't belong to them. And I couldn't bear the behaviour of other people around grabbing and didn't want to share, I had a question in the back of my mind, how did our longest term volunteer Tristan who was first 12 years old or younger handle the situation and so professionally when he went to so many large fires before? Remembering that someone so young could help, that's the other thing that kept me going and I wanted to help more. It has really broke my heart seeing all those kids running around, not knowing where their next meal will come from, not knowing when will they have shelter over their heads and there are still people who are too greedy to share the little they have with other people. Seeing people worried, that there are some men who are just there to get the items so they can sell them. But at the same time I met people who we eager to share with the ones who had nothing. There were two grown up women who begged for clothes and they accepted every cloth you gave them; they weren't picky about what you we giving them, they didn't ask for more than what you we willing to give. I got so sad to see the other people who were busy drinking, and they had had the cheek to come and grab clothes and food at every chance they had. And there was a woman who was helping, but ended up being the one causing more trouble for other people, she was grabbing clothes from people's hands while she had a bag full of clothes. She was just greedy and controlling to others. I fear for the toddlers who are sleeping outside tonight; it will be 5 degrees or even colder. Evelyn Ramohai (MaThabo), Patrick and four grandchildren. Julia Mlaba wants help for her three daughters aged 4yrs,6yrs,11yrs and her son aged 17yrs. Nduvhu wo Tshiba has two hungry children aged 2yrs and 9yrs. She wants blankets and food. Petrus Rakakole - has one child of 7yrs. Need food and blankets. Simon Rachede -wants food and shelter for his children 7yrs and 11yrs. Khwethe Mbedze and a child of 9yrs wants blankets, food and clothing. Elize Phelodi has two children aged 3rys and 7yrs. Abram Rachidi has one child aged 4yrs. Susan Mosiepane has two children aged 4yrs and 8yrs. Need blankets, clothing and food. Damsy Rachemosd has a child of 13yrs who is epileptic. They need medicine, food, clothes. Alpheus Modisang has a baby aged 8months. He lost everything. Maria Monnammi (59 yrs) has three children 13, 15 and 26. They need help. Patricia Molefe has one child aged 6yrs; needs blankets, food and clothing. Josephine Mosiapane used to live in B936; nine people live in the shack, 4 adult and 5 grand children. Vhutshilo Mulaudzi ( 26yrs) has two babies who need clothing and blankets. Joseph Rethabile lost everything; his children were in the rural areas. Kolebogile Setilo (31yrs) has three hungry children 5, 10 and 14yrs. They lost everything. Helen Molokomme (25yrs) has a child of 3yrs; they need blankets, food and clothing. Salvation Molefe (28yrs) has one child aged 3yrs; they need blankets and food. Janet Kgathela(32yrs) - B42( sharing), has two children 9 and 13years lost everything. Joel Maine 36yrs) - B41 has three children 2.4 and 11 years. Anna Mpele(65yrs) - B129 has four children 4,5,9 and 12years. Fatuse Vuyiswa (31yrs) - B448 lost everything. Modise Notwane(31yrs) - lost everything. Humbulani Gerson Ndou(51yrs) - C287 wants money from government. Portia Mokgosi - B368 has three children 5, 12 and 25 years they lost everything. Goden Mochongane(18yrs) - C112 has one child. Sinah Motsi(43yrs) - has three children 2, 19 and 24years. Dorah Montheng(55yrs) - no shack number. Aaron Mosiapane( 25yrs) lost everything including ID document. Marielle Letoso(46yrs) - B77 has three children5, 19 and 25 years. Aster Boysen(42yrs) has three children 7, 14 and 21years the father lost everything.